THE NEWS-JOURNAL AND THE LISTENERS OF WNDB NEWS RADIO. We provide gentle grooming services for dogs and cats. Grooming services include bathing, brushing, hair cutting, nail trimming, ear cleaning, and glands. We are members of the National Dog Grooming Association. For over 40 years Abracadabra has been providing gentle, loving care. Ormond Beach area families entrust us with over 10,000 dogs and cats every year. Our satisfaction rate for the last 12 months was 99.7%! Our family is committed to customer service, and our team of capable groomers, with over 50 years collective experience, can handle all breeds. 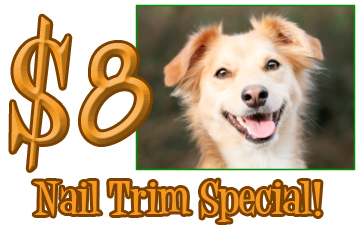 Includes bathing, cageless drying, nail trim, gland expressing, ear cleaning, haircut / styling , bow, and a yummy treat. Starting at $43.00. Includes bathing, cageless drying, brushing, nail trim, gland expressing, ear cleaning, bows, and a delicious treat. Starting at $24.00. Grooming is by appointment on Monday – Saturday. 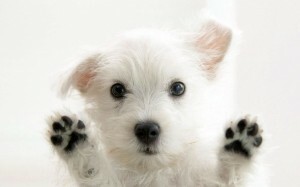 If you only need your pet’s nails trimmed, just walk in between 8am & 2pm. Walk-in welcomed 8am – 2pm every day (closed Sunday). Your pet–and your flooring–will thank you! We have expert knowledge on how to care for and train your pet. We will gladly share our knowledge and assist you in providing the best care for your pet. We have two Vet Techs on staff that will be happy to answer any questions you have about caring for your pet. Read our Pet Care Blog for pro tips on quality dog and cat foods, healthy habits, and more.